The Wort Report: Transformers...in IMAX! If you were living under a rock this summer or were otherwise incapacitated, Transformers was one of the most fun movies to hit the multiplex this year. Is it a great film? Not quite. But it's a phenomenal movie. I won't bore you with the difference between those two terms, but I will say that Transformers does everything it sets out to do. It won't change the way you look at life, but it features a robot peeing on somebody. That's worth at least ten bucks. 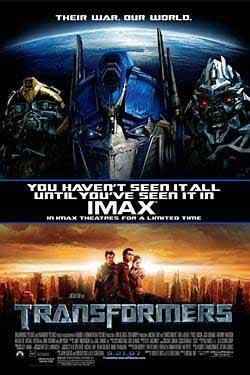 But if your thirst for robot-on-robot action has yet to be quenched, the film makes its way to IMAX screens tomorrow. Click here for theaters and showtimes near you.